Transmission problems in Washington DC should be taken care of as soon as possible so they do not get worse and cause additional damage to the vehicle. Fortunately, manual and automatic transmission problems typically give off warning signs when something is wrong. Watch this video to learn about the signs and sounds of transmission problems. Transmissions are not immune to wearing out over time, but at least they warn their owners when it is time for transmission repair. Always keep an ear out for any unusual sounds that you may hear coming from your vehicle; this could indicate a lack of lubrication of the transmission that can cause the gears to wear out as well as worn out bands in an automatic transmission. Grinding and slipping gears both suggest that it is time to see a transmission specialist for service as soon as possible. Modern cars and trucks are complex machines, and an automatic transmission may be one of the most intricate components. That’s why it’s important to seek the help of a transmission specialist in Washington DC when you have automatic transmission problems. In order to understand automatic transmissions you must be familiar with their purpose within the vehicle, the parts they utilize, and the problems that they may encounter. Here is a brief overview of how an automatic transmission works. The purpose of a transmission is to connect the engine and the drive wheels in order to deliver the appropriate amount of power based on the activity of the engine. Different combinations of gears alter the distribution of power within the system, affecting the speed and handling of the vehicle. When your vehicle is in neutral, the transmission disconnects the engine and the drive wheels, and the park position involves the locking of the drive wheels so your car or truck stays idle. While manual transmissions make use of a clutch for these purposes, automatic transmissions come in either the front wheel drive or real wheel drive varieties. It may seem like the transmission completes straightforward tasks, but the system requires a great deal of cooperation between different components in order to complete the job. An automatic transmission depends on planetary gear sets to form combinations and ratios that determine how quickly the engine rotates. The torque convertor is relatively analogous to the clutch that would be used in a manual transmission and allows you to stop at red lights and stop signs without turning off your engine. 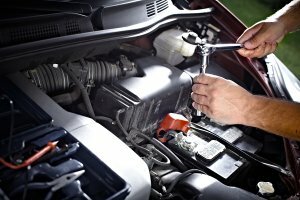 If you notice strange sounds or oil leaks coming from your car, see a transmission specialist immediately. Your transmission is an integral and complex component of your vehicle, and any problems that are not quickly addressed can lead to more aggravated complications. Transmission problems should always be addressed by a professional auto transmission repair service. When you realize something is wrong with your vehicle’s transmission, you will want to bring it into a shop that specializes in transmission repair in Washington DC . Superior Transmissions is one such transmission shop. Highly skilled and trained transmission specialists like the ones at Superior Transmissions are the ones to call when it comes to dealing with transmission issues. Our family owned business has been operating for 40+ years. In that time we have put together an impressive roster of knowledgeable and professional employees. We pride ourselves on our attention to detail and our commitment to unprecedented customer service; our job is to make sure that your rebuilt transmission is in working order and that you are satisfied with the work we have performed. We specialize in transmission replacement and repair for both automatic and manual models, and we use cutting-edge technology to accurately diagnose your transmission problems. Our company is dedicated to all things transmission and would happily provide any transmission services that you need. Visit our shop at the first sign of transmission trouble, or call us to schedule an appointment for your vehicle. The efficient functioning of your car relies on a network of mechanical and electrical components working together, at the heart of which is the transmission. While transmission problems in Washington DC can become aggravated if they are not resolved in a timely fashion, there are methods you can use to prevent such problems from occurring in the first place and extend the lifespan of your vehicle. 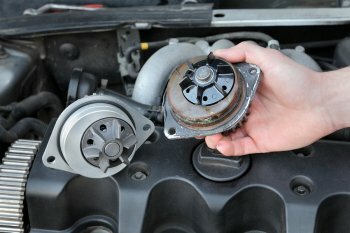 Read on if you are interested in learning about keeping your clutch in good shape. Many factors can influence the life expectancy of your clutch including the maintenance you provide as well as the type of vehicle you drive and the way you drive it. Refraining from riding the clutch can keep your throw-out bearing from wearing out. The throw-out bearing is responsible for disengaging the disk in the presence of pressure on the clutch pedal. Riding the clutch can cause the throwout bearing to spin continuously and ultimately wear itself out, compromising your ability to easily get into or out of gear. The self-adjusting clutches that come with newer vehicles are convenient in that they can help prevent drivers from wearing out their clutches and enjoy a long working life with reduced transmission issues. If you have an older vehicle, however, you will likely need to adjust the clutch manually. 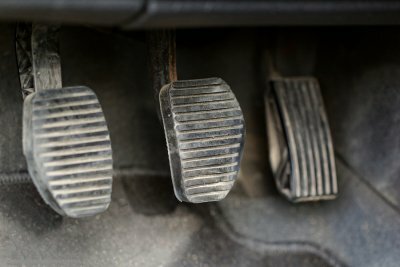 If your clutch pedal moves down about an inch before you have to apply extra effort with your foot, it is relatively well adjusted. On the other hand, a pedal that moves down only half an inch or as much as an inch and a half may need adjusting so your gears do not clash. Worn out throwout bearings, flywheels, and pressure plates warrant attention from professional transmission repair shops in Washington DC. This should be done immediately so that these worn down parts do not have a chance to further wear down additional components of the transmission. Everyone will experience transmission issues at some point or another—the real dilemma is deciding whether to have your transmission repaired or replaced. Every time your transmission shifts gears, clutches and bands inside the transmission must apply and release for the shift to occur. This strain causes extensive wear on the transmission that often leads to major and even sometimes catastrophic transmission failure. But unless your transmission has failed completely, how do you know if a replacement transmission is the right way to go? Here are some factors to consider and discuss with your Washington DC transmission shop to determine whether a transmission replacement is the best choice. One of the most important factors is the age and mileage of the transmission. Automatic transmissions often fail between 80,000 and 150,000 miles. Manual transmissions can fail even sooner than that, especially when routine maintenance is neglected. If you’ve logged more than 80,000 miles on your transmission, it may be in your best interest financially to buy a new transmission instead of spending hundreds of dollars every few months on repairs. Speaking of repairs, consider the transmission’s repair history when deciding whether to repair or replace. If your transmission is plagued by a chronic issue, it doesn’t make much sense to keep dumping money into a transmission that will only end up back in the shop a few months later. Another red flag is if your transmission has had multiple different issues in the past 12 months. Lastly, consider the overall condition of the vehicle itself. If you have an older car or truck that has more than 150,000 miles on it and requires additional repairs and maintenance, you may not want to spend a few thousand dollars on a new transmission. On the other hand, if the transmission is the only thing giving you trouble and the rest of the vehicle is in great shape, investing in a new transmission can help you get even more mileage out of the car or truck you love so much. What Causes a Transmission to Slip? Transmission slippage is a common problem for both automatic and manual transmissions. Unfortunately, your slipping transmission could be caused by one of many different factors, ranging from low transmission fluid to defective parts. Another cause is a worn out or broken transmission band, which can also lead to worn out transmission gears. If your transmission is slipping, visit a transmission repair shop in Washington DC . A certified transmission repair expert can diagnose the cause of your slipping transmission and get you back on the road and back to your normal routine. You should also look into a transmission tune-up to make sure your transmission is running as smoothly as possible. When your transmission starts to develop a problem, you need to act fast to avoid making the problem worse. The good news is that most transmission problems are easy to spot early on. The most obvious signs of a transmission problem include grinding during gear changes, difficulty shifting gears, or a burnt smell from the fluid. Watch this video to learn more about these and other common signs of a transmission problem. If you experience any of the symptoms discussed in this video, schedule a transmission inspection with a transmission repair expert in Washington DC. Transmission issues will only get worse over time, so schedule transmission repairs as soon as you recognize something wrong with your transmission. Of all the fluids inside your vehicle, transmission fluid is one of the most important. Driving with low or dirty transmission fluid can cause excessive wear and tear that ultimately leads to unexpected transmission issues. Like any other vital automotive fluid, transmission fluid deteriorates over time. Consult your owner’s manual or talk with your transmission repair shop in Washington DC to determine the best fluid maintenance schedule for your vehicle. 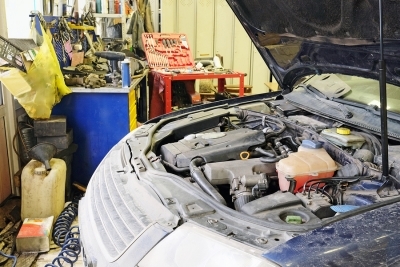 Here are some important things to know about transmission fluid. Transmission fluid helps keep your car’s automatic or manual transmission cool and lubricated. In automatic transmissions, this fluid also serves as a viscous fluid that transmits power from the engine to the transmission. Manual transmission fluids contain a variety of oils, including regular motor oil and heavyweight hypoid gear oil. If you’ve been to an auto parts store recently, you know that there are lots of different types of transmission fluids to choose from. Different fluid specifications use different additives and ingredients to achieve specific fluid properties and performance. Drivers also have a choice between conventional and synthetic transmission fluids. Synthetic fluids can be twice as expensive as conventional fluids but offer better performance and improved resistance to heat, cold, oxidation, friction, and shearing. Regardless of whether you have a manual or automatic transmission, you need to inspect the level and condition of the transmission fluid on a regular basis. If your transmission is low on fluid, look for signs of a leak. When checking the fluid’s condition, be on the lookout for fluid that is dark or smells burnt. 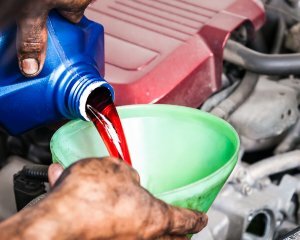 If your transmission fluid is dirty or burnt smelling, bring your vehicle to a Washington DC transmission repair shop for a fluid flush and fill. Automatic transmissions may be easier to maintain and repair than manual transmissions, but that doesn’t mean they aren’t without their own unique set of problems and challenges. Fortunately, automatic transmission problems are relatively easy to spot, which means you can have the problem repaired before your transmission fails completely. Leaky fluid, rough shifts, delayed gear engagement, and dashboard warning lights are some of the most obvious signs of a transmission in need of repair. Watch this video to learn how to spot problems early on with your automatic transmission. If you suspect your automatic transmission is going out, visit a transmission repair shop in Washington DC as quickly as possible. The sooner your transmission is diagnosed and repair by a professional, the better. Putting off transmission repair will only make the problem worse, and may even lead to more expensive and time-consuming repairs. If a specific component needs to be replaced or fixed, you may be able to have your car back in a few hours. A thorough transmission inspection can pinpoint the issue and help you determine whether straightforward repair is a good option. While transmission repair is the easiest and oftentimes least expensive solution it may not address the underlying cause, which means you could end up in the transmission shop again in a short amount of time. When a transmission is rebuilt, it is disassembled and inspected and the worn or damaged parts are replaced before the transmission is reassembled to factory specifications, along with new gaskets, seals, clutches, and bands. A rebuilt transmission will provide you with greater confidence and peace of mind than simply repairing defective components. Because the each component is thoroughly inspected after being disassembled, your transmission repair provider is more likely to identify small problems before they cause major transmission failure. Another option is to have a replacement transmission installed in your car. 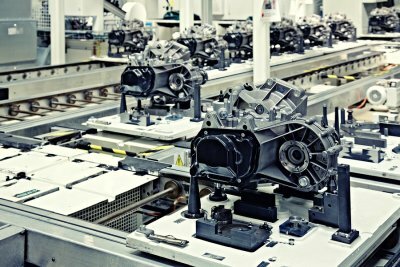 Although new transmissions are only used in the production of new cars and trucks, you can purchase a remanufactured transmission. Low-mileage used transmissions generally cost less than a full transmission rebuild, but in most cases also come with a lesser warranty. Your transmission repair shop in Washington DC can help you decide whether a rebuild or replacement is your best option.